When Judie Jamison was a child, pickle making was a family tradition. She grew up eating her grandmother’s pickles, a recipe brought over from Germany by her great grandmother. Her father continued the tradition, and every year he would choose a couple of days for the whole family to get together to make a few hundred jars of her great grandmother’s secret recipe. The kids stood in the basement at the wash tub to scrub dirt off the cucumbers and the adults prepared the jars of pickles in the kitchen. At Christmas time the pickles would be ready to eat and given as gifts. 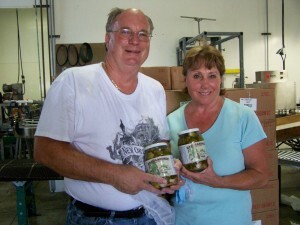 When Judie’s father retired, he moved to California and the pickle-making tradition ceased. Family and friends missed their Christmas pickles, and store-bought pickles just didn’t compare. Judie decided to ask her father for the recipe and made a few batches to give away to family at Christmas time. The family was happy that the pickles made a comeback, so she continued to make them once a year to give away during the holidays. Friends told her she should go into business selling her pickles, but she worked as a Claims Adjuster for SAIF Corporation at the time and didn’t think much about it. But Jamison’s husband who works as a director of sales persisted to plant the idea in her head until she was sold. In 2002 Jamison produced a test batch to give away as samples, along with comment cards asking for feedback. Before committing to start a business, she wanted to know if people liked the pickles enough to buy them. The family helped her make 500 jars of pickles on her deck, peeling garlic and cutting dill by hand, soaking the cucumbers in the kiddy pool outside. When she was a kid her dad would put the jars of pickles upside down in cold water in the bathtub to cool. But this particular batch of 500 jars did not fit, so they emptied the hot tub in the back yard, filled it with cold water, and in went 500 jars of dill pickles. She named the pickles “Baumgardner Pickles” after her dad’s last name, and gave the jars to coworkers, family and friends and told them to pass the pickles along to people they knew. Jamison received overwhelmingly positive feedback and became more serious about the idea of selling her product. In 2003 Judie joined a friend who also pickled her own vegetables to sell their products together in a booth at holiday markets and bazaars. The only person who wasn’t convinced about the idea was Judie’s stepmother. “She thought that my dad would have thought we were nuts,” says Jamison. Turns out she wasn’t nuts. Jamison sold a lot of pickles at the holiday events, so they decided to sign up for a booth at the Salem Saturday Market. They rented out a kitchen at the Methodist church inSalemand gathered friends and family to start packing 800 jars of pickles. They nearly sold out their entire stock that year. “We developed a following, and people asked ‘where else could I buy it?’” says Jamison. But she never had any plans to sell them beyond the Saturday market. The following year Jamison and her ‘crew’ doubled production and made 1,800 jars. “That became more than any of us could handle,” says Jamison. “Family and friends said ‘I think we’re done packing pickles!’ My stepmother said she’s not cutting another piece of dill in her life,” Jamison says. With the guidance of the USDA, they decided to start using a co-packer. It was a smart move, because that was when Baumgardner Pickling Company got its first big break. Jamison was doing a demo of her pickles at a Salem Women’s Luncheon, providing samples and talking to prospective customers. A representative from Roth’s Fresh Markets tried a pickle and loved it so much she asked her to bring in sample jars with the possibility of selling them on their store shelves. That encounter led to an agreement to begin selling Baumgardner Pickles in three of their stores. Today, Baumgardner Pickles are sold in all of the Roth’s Fresh Markets. After that first success, calls for Baumgardner Pickles kept coming in. Tillamook County Creamery contacted Jamison for Baumgardner Pickles shortly after the business started, and they have been selling the pickles in their store ever since. Whole Foods inSouthern Californiacalled asking for the pickles on their shelves, and now Baumgardner Pickles can be found in Whole Foods Stores along the West Coast. Baumgardner Pickles are also sold at all the Lamb’s Thriftway stores and Market of Choice stores. But selling Baumgardner’s Pickles hasn’t been easy for Jamison. “The big thing is I’m not a sales person like a lot of people are. I can’t begin to tell you the challenge that it was for me to be out demoing and selling them and calling on grocery stores one-on-one. I’m just not somebody to walk up to somebody and start talking and that’s been really hard,” says Jamison. Although her shy demeanor has been difficult for her to overcome, the relationships she has established with her customers has been a key motivator and one of the reasons she loves what she does. The success of the business has been a true family effort. Her brother in Southern California calls and visits stores in the area, and successfully got Baumgardner Pickles on store shelves at Mother’s Markets inCaliforniaand other high-end specialty stores. Her son inIdahogot pickles on the shelves at the Boise CO-OP, and her mom, daughter, husband and granddaughter volunteer to demo the pickles at stores and events. 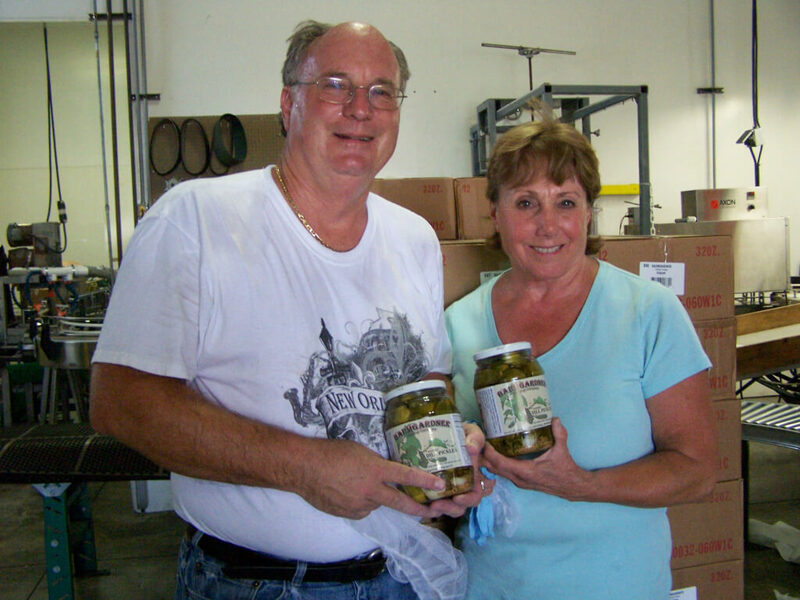 With the whole family pulling together, Baumgardner Pickling Company sells 10,000 jars of pickles a year on average, and they are in 109 stores on the West Coast. Baumgardner Pickling Company is proud to have an all-natural product with ingredients completely grown in the WillametteValley. 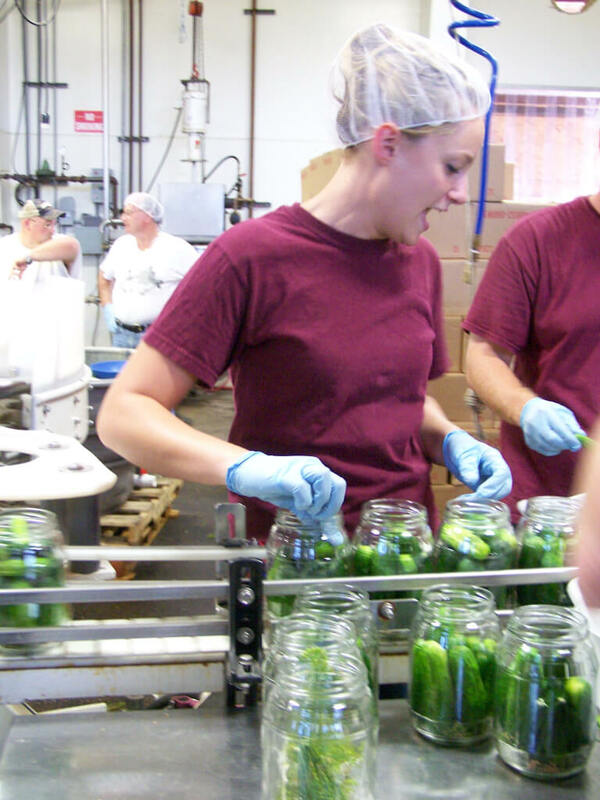 Their main grower for pickling cucumbers and dill is Sonnen Farms in Aurora, and their co-packer is Dundee Fruit Company in McMinnville. This year they bought 10,000 pounds of cucumbers to pickle. 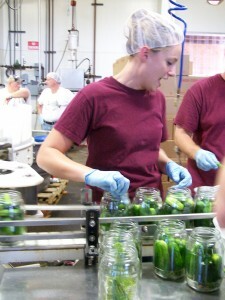 All the cucumbers are ‘fresh packed,’ put into jars within 12 hours of leaving the farm. “We’re committed to having an excellent product 100 percent of the time,” says Jamison. Her next pickling project is experimenting with her brother’s persistent idea of what they call “hurtin’ gherkins.” Baby cucumbers pickled with habanero peppers. “It’s going to be hot,” says Jamison. With her family there to back her up, she should have no problem getting them onto—and off—store shelves.